Call the office at 206-623-8632 if you have any questions. 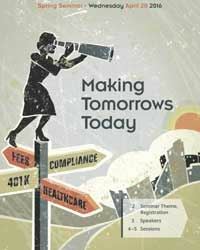 The WP&BC Spring Seminar’s focus is to provide benefits professionals with tools, knowledge and new ideas to help “Making Tomorrows Today” for pension and benefits plan participants. This year’s Spring Seminar will continue to offer key industry updates necessary to stay current as benefits professionals. In addition, we are offering several sessions that look into the future of benefits programs with evolving trends and proposed regulatory and legislative changes. Back by popular demand from last year’s Spring Seminar, Martha Tejera, a longtime member of the Seattle Chapter’s Board, is moderating the morning keynote session for the 2016 Spring Seminar. This session will center around a panel of local large employers, willing to share with the audience their views on current topics related to both health and wealth. Over our lunch hour, we will be joined by Carol Vecchio from the Centerpoint Institute for Life and Career Renewal. Carol will share how to navigate through change and manage our tomorrows today. We will learn how to clear the fog hovering around change so we can listen, understand, and manage our own transitions as well as support the shifts of those with whom we live and work. WP&BC is having a social gathering at the end of the sessions including cocktails, beverages and appetizers starting at 3:30 pm for all attendees, speakers and guests.